Words cannot express the amazing experience of growth and achievement I’ve had with Banna Property Group over the last 10 years. After starting with a team of 2 people, to a ‘family’ of 15, I could not have imagined that what started out as a property development role, slowly morphed into a leadership journey learning about the impact of drivers vs expressives, strengthfinders, 3in3s, UNO games, circumplexes, and emotional intelligence. With a heavy heart, I now leave a business that has built momentum and on the verge of becoming a Jim Collins-esque ‘Good-to-Great’ company. It is not only a company that embodies teamwork in its truest sense, but also one that believes in an unwavering care for its members as if it were a family unit. 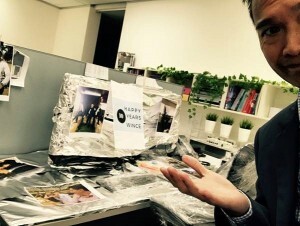 The best part is that the team has had so much fun along the way whilst fulfilling its goals (see the photo of my desk wrapped in tin foil to celebrate my 10 years at the company). I enter the next chapter of my career in pursuit of a new challenge, and take with me an open mind (and heart), and trust that my experience at Banna can add immense value to the teams I work with in future.